Smoothies are great for taking your breakfasts on the go. This Strawberry Shortcake Smoothie is perfect for that. I added chia seeds and quinoa flakes to it, so there is good protein and fiber which should keep you full for a long time after. Did you know that quinoa is actually a complete plant based protein? That is why I love adding the flakes to my smoothies. Another breakfast that is great for on the go is overnight oats. If you haven’t given them a try, I highly suggest you do. 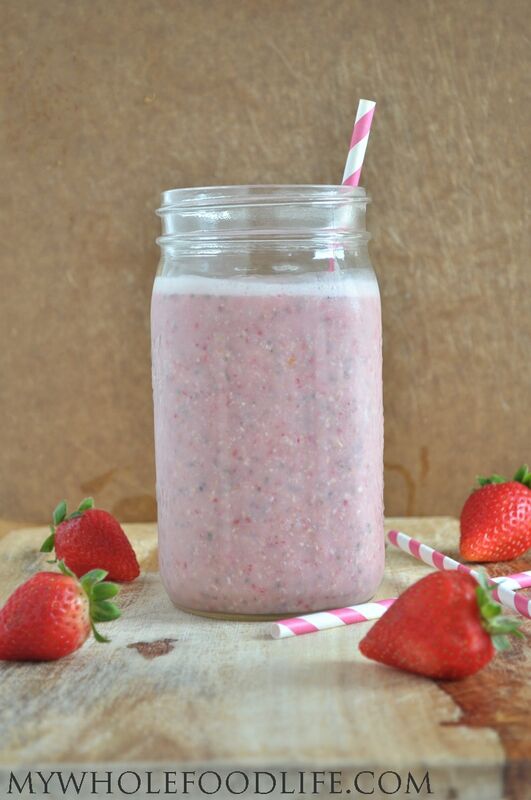 This strawberry shortcake smoothie is vegan and gluten free. I hope you enjoy it. I have been buying up all the strawberries since they have been in season. Then I freeze them so I can enjoy berries all year long. I cannot justify the price of berries out of season. Way too much for me. That is why I stock up and freeze. If you like smoothies, you may also like this and this. A healthy breakfast for on the go! Mix all ingredients in a blender very well. Serve immediately or freeze in ice cube trays for later. Feel free to add greens to this if you wish. I suggest about 1 cup loosely packed spinach or kale. You can also pour this into popsicle molds. Enjoy! This looks wonderful!! Is there anything I can substitute for the quinoa flakes? Maybe oatmeal or cooked regular quinoa? Thanks!! Thanks! Oatmeal will work great too!